The Penland School of Crafts is one of the oldest and most prestigious handicraft schools in America. Located in the western mountains of Mitchell County, the school was established in the late 1920s by Lucy Morgan, director of the Appalachian School in the village of Penland. While visiting Berea College in Kentucky, Morgan learned weaving techniques and returned home with modern looms and the idea of reintroducing the art of weaving cloth to her community. The Penland School originally served as a training ground and social center for area women. Eventually, Morgan also assisted local craftspeople in selling their finished products to tourists. A small cabin on the grounds of the Appalachian School served as Penland's first home. In 1928 Penland advocate Edward F. Worst of Chicago wrote an article in the Handicrafter. Soon Morgan received applications from people from outside the community interested in studying handicrafts at Penland. During the next 33 years, people from around the world found their way to Penland to learn traditional crafts such as pottery, basket weaving, silversmithing, and metalworking. In 1962 Morgan retired, and Bill Brown, former assistant director of the Haystack Mountain School of Crafts in Deer Isle, Maine, became Penland's second director. Under his leadership, Penland moved from a school devoted to teaching traditional crafts to a school focused on advancing the professional aspects of handicrafts and exploring innovative craft techniques. Brown hired the best teachers in their respective fields and added woodworking and glassblowing to the curriculum. 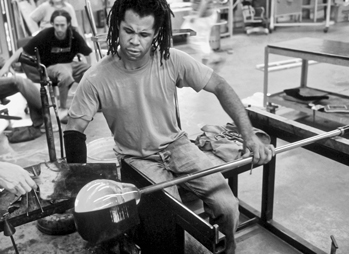 Penland was one of the first schools in the country to teach the art of glassblowing, a pursuit that has attracted such artists as Harvey K. Littleton, Mark Peiser, and John Nygren. Many students continue to pursue their craft on a professional level and have achieved critical acclaim after leaving Penland. The Resident Craftsman's Program enables artists to enjoy their own studio space. Resident artists are full-time, self-supporting craftspeople who live and work at the school for three years. Developed by Brown, the program provides participating artists with the time to develop their techniques and explore the marketability of their work and provides students with models for a life in craft. The Penland School of Crafts continues to attract people from around the world, and the school remains a popular haven for artists. From the original cabin, the school has expanded to include 41 structures on its 400-acre campus, hosting more than 1,200 people each year. The school offers one- and two-week classes in the summer and eight-week sessions in the spring and fall. Most classes are a mix of demonstrations, lectures, individual studio work, and field trips. The school features courses in book- and papermaking, clay, drawing, glassblowing, metalsmithing, photography, printmaking, textiles, and woodworking. The Penland Gallery is the information and display area of the school. Attracting over 14,000 visitors each year, the gallery displays and sells work by Penland instructors, resident artists, students, and neighbors. A knowledgeable staff provides information about craft processes, the school program, the artists, and studios in the area.